Spark! is a powerful, dazzling light that shines when a person gets a flash of inspiration. When you are feeling that your speech is not improving at all, one day you talk to someone who has the same frustration and you suddenly get a flash of inspiration. You then realize what you have to do. When a person gets a flash of inspiration, he or she will grow drastically. The District Conference is the largest festival of Toastmasters in Japan. It is the only occasion during the year where more than 700 Toastmasters gather in one location. This is truly the Spark! that will accelerate our growth. After that, I studied thoroughly and deeply to pursue the essence of speeches, and I was able to become the Japanese speech champion of the District Contest in 2006, and the English speech champion in 2007 and 2008, respectively. I have also continued to study hard to master leadership, and got the opportunity to serve all of you as the 2015 District Director. The two moments of Spark! that I got at the May 2001 District Conference greatly changed my life afterward. 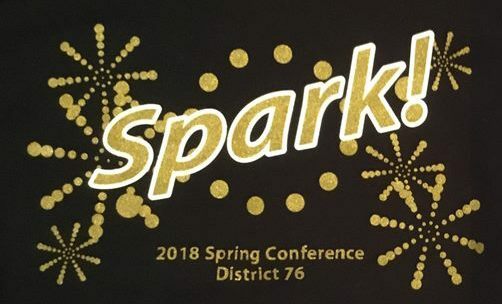 The Spring District Conference in May of this year will also be an opportunity for many of the participants to feel Spark!, and to make a leap forward to the next stage. I would like to encourage all of you to deepen your dialogue with many people, and have your own moments of Spark! I am looking forward to meeting you all at the District Conference.